Wall Art - Website of jengstudios! 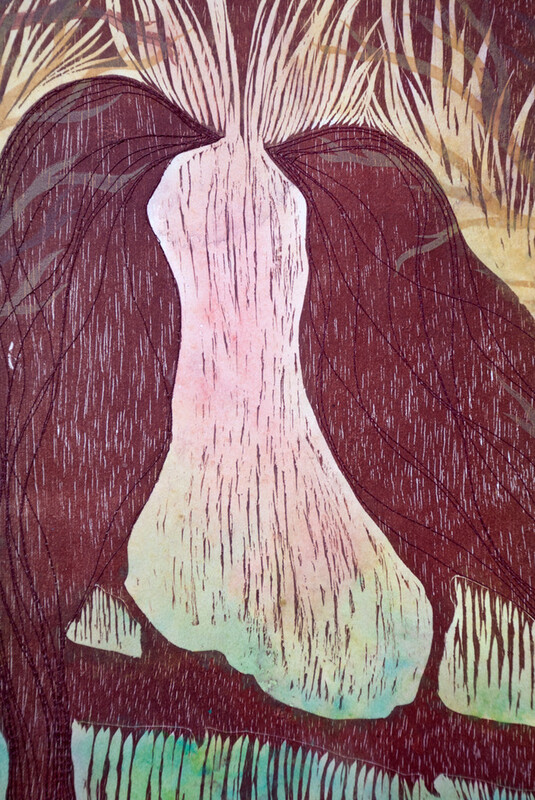 My approach to artmaking typically begins with an image paired with a printmaking process - screenprint, woodcut, intaglio, monotype, or any combination thereof. 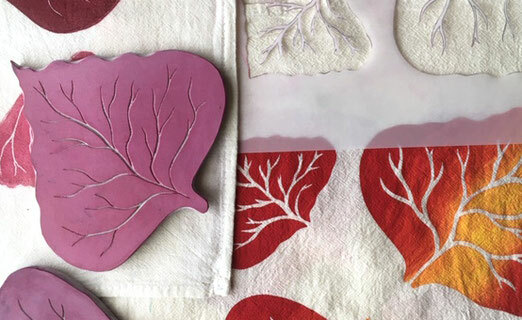 I also employ sewn elements, acrylic wash effects, hand coloring, and encaustic wax when necessary. Mixed media prints and installations, paper and fabric. Great for the home, office, and small commercial space - anywhere that needs a little splash of color and inspiration! Commissions, custom projects, and special orders are welcome! Totally colorful Colorado! Originally created for Artcrank event in Breckenridge, CO.
9 layer hand-pulled stencil screenprint poster on smooth white Cougar paper. *Due to handmade nature of this print, slight variation in sky color is to be expected. 23" wide x 18" high. Full print with tree and all 4 bikes. Will be shipped rolled up in tube. Simply flatten or reverse roll before framing or hanging. 12" wide x 18" high. Vignette with tree and 2 bikes. 11" wide x 17" high. Vignette with just 2 bikes. Very cute and original, this set of two of one-of-a-kind artwork will brighten any place where they hangs - together or separately! Mixed media print on paper with machine stitching. 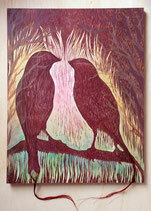 Mounted to wood panel, and a layer of encaustic wax on the surface. Edges are finished with gray acrylic paint. Very cute and original, this one-of-a-kind artwork will brighten any place where it hangs! Printed in a series, each piece exhibits unique characteristics and nuance. woodblock, trace monotype, stencils, acrylic wash, machine stitching, encaustic wax, wood panel. Warm and lovely, this work of art is a reflection of so many unspoken moments. The gesture is one of many moods and feelings we all know too well. Original woodblock print on paper, with screenprint tree branches, and machine sewing over the birds. Watercolor wash effects add a unique atmosphere and set the mood of the conversation between these two. 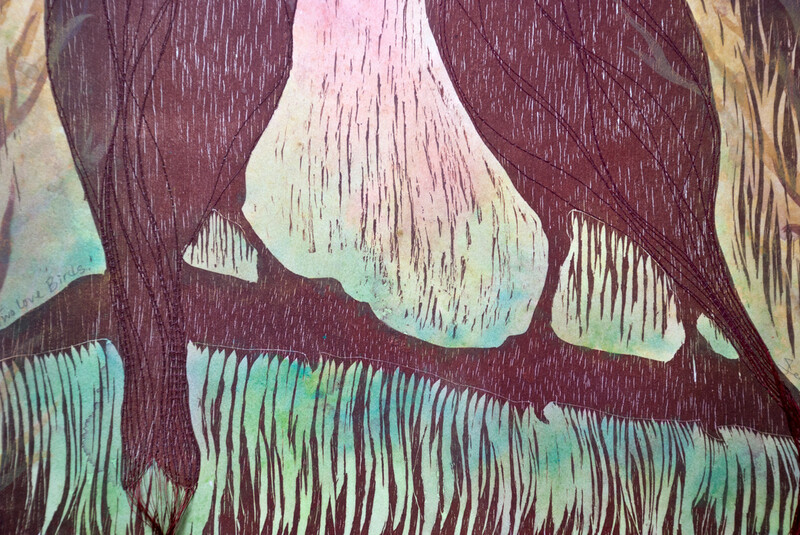 woodblock, screenprint, acrylic wash, encaustic wax, wood panel. Piece is lightweight, hangs with a sawtooth hook. Wax is completely stable, can hang in dry or humid environments. Do not hang in direct sunlight, UV light can be intense. This piece measures 2 1/2" wide by 4 1/2" tall, the threads dangle an additional 3 to 5 inches. 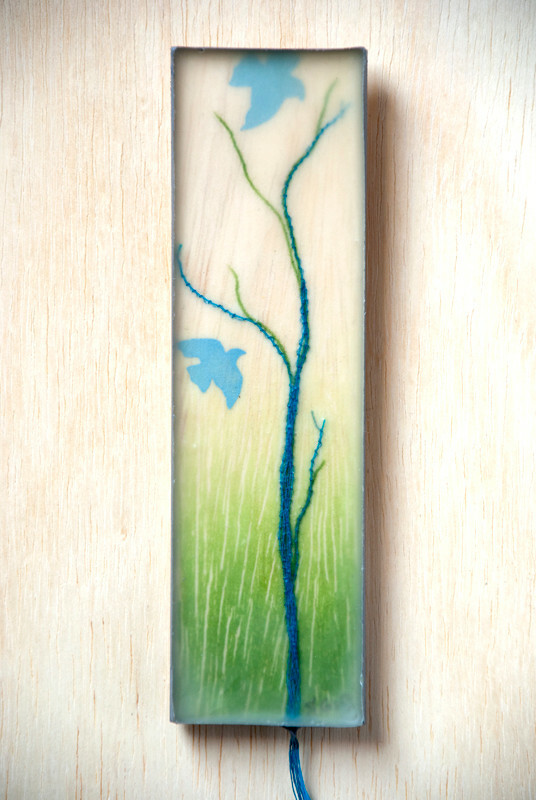 This piece measures 1 3/4" wide by 8 1/2" tall, the threads dangle an additional 3 to 5 inches. 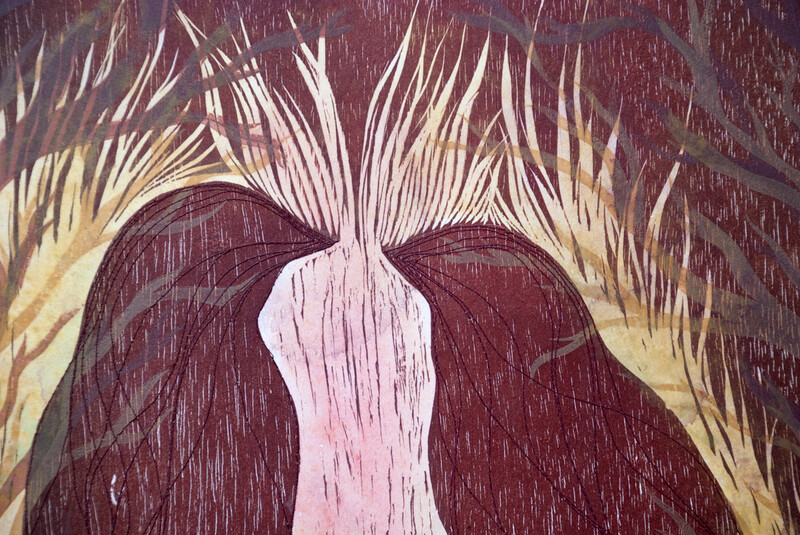 3 plate woodblock print on Thai Mulberry. email jengstudios@gmail.com for framed price.